What Are Four Of The World’s Top Ranked Paddlers Doing In New Zealand This Week? Post by The Ultimate Waterman. Results are in from one of the more exclusive SUP races on the calendar: The Ultimate Waterman, an invite-only event that’s been happening in New Zealand all this week. The competition, which sees 8x elite ocean athletes descend on the country for six days of surfing and paddling, is a made for TV style production that attempts to crown the best all-round ocean athlete. It has the backing of major companies such as Red Bull and looks to be a fairly high-end affair. And lucky for us, SUP is a major focus of the event and half of the competitors are famous stand up paddlers. The SUP specialists that got a very special invitation to NZ are Connor Baxter, Kai Lenny, Danny Ching and Georges Cronsteadt. And it’s no coincidence that those guys just happen to be four of the highest-ranked paddlers in the world right now. Connor, Kai and Danny hold the top three spots on the SUP Racer World Rankings, while Georges isn’t far back in #7 (and he’d probably be higher if not for a couple of uncharacteristic results in 2014). The event combined outrigger, SUP surfing, SUP racing, shortboard and longboard surfing (there was also supposed to be a big wave surfing element, however conditions didn’t cooperate). Danny Ching got off to a flying start, taking the opening event – the one man outrigger (or “Waka Ama”) race by the narrowest of margins. Tahiti’s Georges Cronsteadt was leading in the dying stages, however Danny chose a better line to the finish and snuck through for the win by under half a minute. Connor was third and Kai 4th. Each athlete was allowed to nominate a single event as “double points” – and it was no surprise to see Danny doubling up on this one. The overall standings got mixed up and down through the week during the SUP surfing, shortboard and longboard events, which all lead into the final competition: The SUP race. UPDATE: The grand finale of the Ultimate Waterman competition, and the one I was very curious to see the results from, has just finished: The 15km SUP distance race. And despite being up against three of his fiercest competitive rivals, Connor Baxter has walked away with yet another trophy. After over one and a half hours of high-paced paddling action, the Maui wunderkind crossed the line just 8 seconds clear of Danny Ching. The pair had been in a neck-and-neck race of their own over the second half of the course, breaking clear of Georges and Kai earlier on. Coming down to the final stretch it was anyone’s race, however Connor made the most of the bumps to pull away over the final kilometre. It’s amazing just how close the final times were, considering how difficult drafting would have been in these waters (and if you look at the pics, you can see Connor and Danny weren’t even drafting each other over much of the final stages). 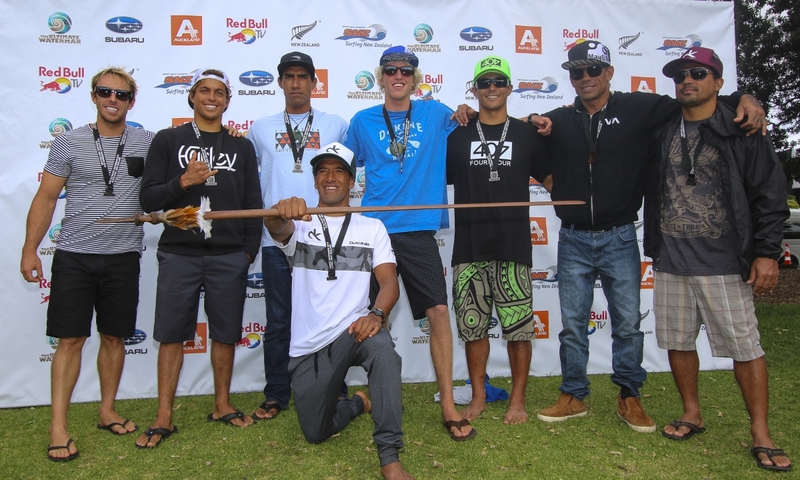 The Tahitian Bull, Georges, went on to claim third place, while Kai drifted towards the end and had to settle for 4th. This result is quite interesting as it’s a similar distance/conditions to what we’ll see at the massive Carolina Cup, which is coming up in a month’s time and looks set to feature pretty much every elite paddler on the planet. Today was 15km while the Carolina Cup is a little longer at 20km. Today’s SUP distance result had a more immediate impact though: With his 5th place finish, the race gave local boy Daniel Kereopa the overall Ultimate Waterman title. This is quite a fairy-tale seeing he was the only New Zealander (and probably the least well-known athlete) among the group. Anyway the full results are below, as well as video highlights from each day. More pics on the official FB page. While this may not be your average SUP Race, it is very cool to see brands such as Subaru and Red Bull investing so much into an event that focuses a lot of its attention on stand up paddling.